As Hurricane Lane approached Hawaii, where I live, with 170 mph winds on August 23, I began having visions of my departure from this realm of existence. Our governor announced that there are not enough evacuation centers for the majority of the population and suggested we stay in our homes, even though it is obvious that most of the single-wall frame dwellings in the state cannot resist such torrential winds, probably not even 70 mph forces. I had visions of our roof flying off as my wife Gina and I hovered under the heavy mahogany dining room table before we too experienced “lift off” and went flying off yonder. As Lane moved closer and closer to the island with some “scientific” projections showing a direct hit or the center of the hurricane being at least close enough to cause disastrous winds, I began to feel like a prisoner on death-row must feel while awaiting execution the next day. My biggest fear, however, was not that I would die but that I would survive it. Although I have come to view death itself as a transition to a larger, more real life, the dying part of it all has never seemed especially easy or appealing. I thought that if I were alone it would not be too traumatic, but I was concerned about Gina being able to handle it all. To put it another way, I was more or less prepared to “go west,” as they used to say about death, but I felt much anxiety about my wife and other loved ones following me at the same time. Fortunately, Lane decided to “go west” from its path toward our island, about 150 miles short of impact, and we lived to see another day. It was the third time this year that I thought my time remaining in the physical world was very short, the first being the false ballistic missile alert here in Hawaii during January when someone at the civil defense headquarters pushed the wrong button. For some 38 minutes, there was considerable anxiety as the people of Hawaii ran for shelters and braced themselves. After the initial alert, I flipped on the television and saw a basketball game still in progress and programs on other channels also in progress, leading me to believe that it must be a false alarm. But, still, it was an anxious time and I tried to mentally prepare myself for the worst, while hoping I would not survive a nuclear blast. The second time was just two weeks before Hurricane Lane. My A-Fib (atrial fibrillation) condition was acting up and resulting in some very shallow breathing. It was the worst I had experienced and I went to bed that night thinking that it was about 50-50 that I would wake up the next morning. Such are the trials and tribulations of old age. The closest to death’s threshold I can recall being at before this year was on May 13, 1969 when living in Kuala Lumpur, Malaysia and getting caught up in the middle of the Sino-Malay riots, with bolo knife and machete-wielding rioters headed in my direction less than 15 seconds from me. Around 200 people – some estimates put it at closer to 600 – were slain on the downtown streets that night, but somehow I managed to survive that one. There was no time to think about death on that occasion. My focus was strictly on getting my two young daughters under cover. My recent experiences suggest that having time to really think about one’s impending demise is not a particularly good thing – unless, of course, the person survives, in which case it might provide food for reformed thought. 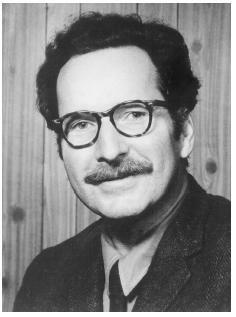 “The irony of man’s condition is that the deepest need is to be free of the anxiety of death and annihilation,” wrote anthropologist Ernest Becker (below) in his 1973 Pulitzer Prize-winning book, The Denial of Death, “but it is life itself which awakens it, and so we must shrink from being fully alive.” As Becker explains it, if I am reading him correctly, all our fears, neuroses, phobias, depressive states, however they are classified, are rooted in a fear of death, even if we don’t recognize them as such. To free oneself of death anxiety, nearly everyone chooses the path of repression. That is, we bury the idea of death deep in the subconscious and then busy ourselves with our jobs, our families, and our toys, escape into fictitious stories in books, at the movies, and on television, and otherwise seek a mundane security that we expect to continue indefinitely, all the while oblivious to the fact that in the great scheme of things such activities are exceedingly short-term and for the most part meaningless. “We enter into symbiotic relationships in order to get the security we need, in order to get relief from our anxieties, our aloneness and helplessness; but these relationships also bind us, they enslave us even further because they support the lie we have fashioned,” Becker goes on. “So we strain against them in order to be more free.” In effect, Becker states, “the essence of normality is the refusal of reality,” or to look at it another way, all “normal” people are neurotics and most of those called neurotics are in touch with reality. Becker refers to this “secure” person as the “automatic cultural man.” He is “man confined by culture, a slave to it, who imagines that he has an identity if he pays his insurance premiums, that he has control of his life if he guns his sports car or works his electric toothbrush.” Becker borrows his “automatic cultural man” from Søren Kierkegaard’s Philistine – man fully tranquilized with the trivial. As Kierkegaard, referred to as the “father of existentialism,” saw it, most people are so absorbed in philistinism that they don’t even realize they are in constant despair from their fear of death, all the while using repression as a defense mechanism to overcome that despair. Becker explains that one’s basic narcissism is increased when one’s childhood experiences have been securely life-supporting and warmly enhancing to the sense of self. “We might say that [a man’s] repression of the idea of his own death is made easy for him before he is fortified against it in his very narcissistic vitality.” He mentions an increase in anxiety neuroses in children living in Southern California as a result of a number of earth tremors there. “For these children the discovery that life really includes cataclysmic danger was too much for their still-imperfect denial systems – hence open outbursts of anxiety,” he writes, adding that adults display this same manifestation of anxiety in the face of impending catastrophe. Although I am not aware of any study resulting from the false missile alert here in Hawaii during January, there were certainly indications of such anxiety reported in the media following the incident, and I suspect that Hurricane Lane has served as an eye-opener for many, perhaps getting them to wonder what life will be like if they have no electricity and no smartphones to play with 24/7 and thereby escape from death anxiety. However, as with the tragedies of September 11, 2001, such an awakening seems to last only a few weeks or a few months at most before people return to the ways of the Philistine. I can’t imagine being close to death without a conviction that my real self would survive. Being blown into oblivion by a nuclear blast, falling asleep into oblivion as my heart gives out after more than 80 years of faithful service, or flying off into oblivion with the winds is a bit more than my psyche can handle or endure. I know there are some nihilists who claim the idea of total extinction doesn’t bother them because there will be no consciousness to realize that one is extinct, but I suspect that such stoicism is just so much bravado (pretend courage) designed to protect the ego. All I can end with is that I am glad to have found an ideology that Becker couldn’t find. Moreover, it goes beyond Kierkegaard’s “faith” to “conviction” and provides hope to overcome the despair that Becker and many others have experienced in dealing with man’s greatest fear. And now to prepare for the next hurricane, already headed in this direction. Next blog post: Sept. 17. Hi Mike. I often think of you over there, and really enjoyed the couple of times I managed to have a chat with you on the phone from down here in New Zealand. I really enjoy reading your blogs, you seem to hit the nail on the head each time so eloquently! I am very relieved that you and your family are safe after the hurricanes and that you have weathered yet another storm of a medical kind. I am sorry to know you have been through all of this, and I wish you only the best from now on! Michael said he’s taking only propranolol that’s not the best drug for the A.Fib (IMHO). We doctors give Coumadin or new anticoagulants that need only 24 hrs of suspension before the surgery, like Rivaroxaban. These ones (NOA= New Oral Anticoagulants) don’t need blood tests every week, as Coumadin, only a control of kidneys’ functionality. Sorry to hear that you have been under the weather both literally and figuratively. As Bette Davis is reported to have said “Getting old is not for sissies.” You have suffered a lot of stress this year with the “atomic bomb threat”, the volcano and the tropical storms. Those are pretty big stressors. Most of us would succumb to them I think but you have survived (as usual). Propranolol is one of the safest medications having been used for many years to block the affects of adrenaline. As you may know it is a non-specific beta-blocker and blocks the affects of adrenaline all over the body not just the heart. I take a little every day to calm my nervous system and slow down my heartbeat when it starts skipping around. My grandfather had a pacemaker and after they wheeled him from his hospital room to the surgery suite to have it put in my mother and I went to the cafeteria to get something to eat thinking that it would be some time before he got back in his room but after our snack we returned to his room to find him back in his bed wondering if when he died (he died many years later at 101) what would become of the pacemaker. He didn’t want the funeral home to take it out and re-sell it making any more money than they already had made off of him. Since the pacemaker is placed under the skin in the upper chest, some bleeding may occur and if one is on anticoagulants, it may be difficult to stop the bleeding so it is wise to be knowledgeable of that possible problem. Feel free to write me at my personal mailbox, if I can help you. Thank you for your additional comments. I don’t want to bore other readers with my physical problems, but I think the shallow breathing episodes resulted from too high dosage (80mg) of propanalol. I’ve cut back to 40mg and have not had one episode since, though I was having them daily (and two very severe ones) while on 80 mg.
Hi, Mike. Your concern about blood clots is exaggerated, I have many patients with a pacemaker and no one had problems. Heparine or new anticoagulants are very effective. We all want you to stay here for many years to read your interesting articles! Thank you for your suggestions relative to a-fib. A pacemaker has been considered, but there are many risks with it, since it involves getting off blood thinners for several days and inviting blood clots. I am taking certain medications as prescribed by a cardiologists. I’ve been living with it for five or more years. Your concern is appreciated. Hi, hope you’re well and the ouragan didn’t hit you. About your atrial fibrillation: no one proposed an internal automatic defibrillator? Do you take Rivaroxoban or other anticoagulants? These therapies are very effective and can assure a normal life. Your personal testimony means a lot to many people and is greatly appreciated. You give comfort to many with your sincere and wise words. I myself will be a little concerned about those loved ones left behind, as you. But all are in God’s Hands…and what better hands could they be in? In our spiritual group, quite a few are looking forward to when it will be their time for transition because they are hoping for less physical suffering (we have a few with very difficult and painful illnesses) and there are some elders who say they are absolutely ready! All looking forward with hope, but with regrets for any wrongful behavior we may have committed in this life. Yet, we also understand we must fulfill what we came here to learn, do and experience in this particular lifetime, so as not to have to repeat it in another. Each day, we have opportunities to replay debt, make amends and fulfill missions (small or great) helping others in ways we have yet no idea about until we leave this plane of existence. Something to think about…people can subconsciously fear death because their soul remembers (especially being reminded in the spirit world when their body is asleep) that they may be on the wrong pathway in material life OR not fulfilling what they had promised to do (a certain task) Or they continue to revel in all manner of vices, and…they fear the consequences of their behavior. Spirit communications reveals that these discussions and warnings occur. However, we each have freewill… and we always reap what we sow. Thanks to all for the comments. As Hurricane Olivia heads toward us, I’m back in the anxious mode, hoping not to follow my roof and fly yonder. Life seems to have more and more adversity, which is good for spiritual development even if hard to deal with. There is another side to the death coin; grief. When you lose someone you love deeply, a survivor starts to wish for a speedy end to this life so that they can remedy that loss. I catch myself fantasizing an acceptable death that is not suicide but sacrifice. I suspect these thoughts are more normal than our culture is willing to admit. Luckily I too have found the spirituality world view and intend to complete this life with its assistance. Although, I do look forward to rejoining my wife the thought of dying still makes this body of mine plenty nervous. Life and death are full of paradox. Michael, I am always envy your writing, and you have opened many windows on reality for me. But this time I am reading something else! Hearing from a person facing existential threats was powerful. Thank you very much. I am relieved to hear that you escaped unscathed from the hurricane. I agree, the only hope is for a continuation of mind beyond death, but it also has to a better existence. A great piece of writing; both comprehensive and insightful. It’s worth re-reading in order to extract the essence and savor its “realities.” The final paragraph (sans the next hurricane) where you refer to our shared “ideology of hope” reminds me that hope is the energy of life and the expectations beyond . It’s the only thing that gets us over the bumps and around the potholes of our earthly journey. As they say, the best is yet to come. I think I’ve said to you before that your long-time service in the interest of Truth is deeply appreciated. I just want to repeat that here. I always feel thankful to read your columns and reviews. On Saturday I got the Journal wrapped in the Newsletter, and devoured both before going to bed. Your latest White Crow blog prompts me to ask whether you’ve seen my 1980 book “A Practical Guide to Death and Dying.” It offers a program for coming to terms with one’s mortality by transcending fear and understanding the nature of reality. I sometimes say it provides a rational basis for religious faith—not the faith of a particular religion but rather the broad perspective gained from research such as yours into psychic research and mystical/visionary experience. If you’d like a copy, let me know. As for aging, I sometimes tell people that, chronologically, I’m 80, biologically, I’m mid-60s but psychologically, the one who looks through these eyes never dies and was never born. (The source of the never-dies-never-born phrase is ancient Hindu wisdom.) So I am happy under all conditions. Mike, I’m delighted to hear that you and Gina made it through the storm with a minimum of trouble. I was very concerned about you and my other friends in Hawaii. This is the best piece of all that you have written that I was fortunate enough to have read! Beautiful blend of heart and intellect.